We’ll get to this part later. The creamy soupy part, I mean. 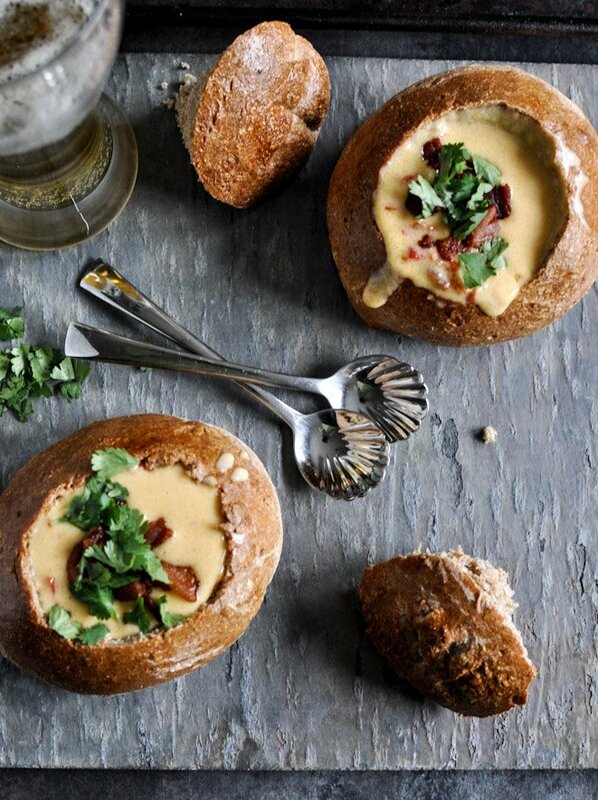 I know it’s sort of hypocritical since I often say that bread is not my drug of choice, but bread bowls? I’m all over them. I will never forget the first time I had one – it was long before Panera showed it’s face… well at least in my area – and it was one summer in Michigan where I found myself scraping spoonfuls of seafood bisque right up along with some soft sourdough loaf. I seriously thought I had died and gone to heaven. Seriously. I had never tried something so delicious and I talked about it CONSTANTLY. I remember bugging my mom about it nonstop and just whining about how this soup came in this bowl made out of freaking bread and OMG why isn’t this a thing everywhere? Then Panera came along and lah dee dah, the magic was gone. I mean bread bowls are still fantastic and I order one almost every single time I find myself there, but the fact that I can go and order one anytime I want? Not as exciting. Also totally amazing. 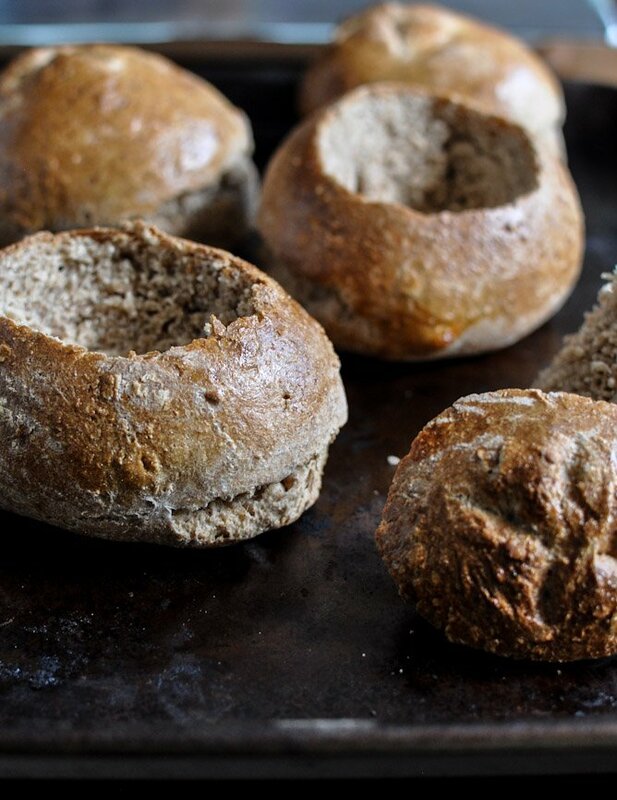 So these, obviously… are a slightly healthier twist on the giant standard sourdough bowls. I’m not gonna lie – I’d choose sourdough over whole wheat any day, especially when it’s dipped in soul-warming soup – but until I get my lazy rear in gear and either make my own sourdough starter or make friends with someone who is willing to gift me some… it’s not gonna happen. And the good news is that aside from your standard dough rising time, they are incredibly simply. Like so incredibly simple that I’m now refusing to eat my soup out of any other vehicle. Homemade Whole Wheat Bread Bowls. In the bowl of an electric mixer fitted with a dough hook, add warm water, yeast, honey and olive oil, quickly mixing with a spoon. Let sit for 5-10 minutes until yeast gets foamy. In a separate bowl, measure out flour and salt. Add in flour gradually with the mixer on low speed. Knead with the dough hook (I used the two lowest speeds for this) for 10-12 minutes, occasionally pulling the dough off with your hands and placing it back in the bowl. Remove dough from bowl (it will be sticky) and place it on a floured workspace. Knead it a few times by hand, adding a few sprinkles of flour until it’s elastic and no longer super sticky. Oil a bowl with olive oil and place the bread in the bowl, flipping it to coat. Cover and set in a warm place (I set it on top of my oven, turned on) to rise for 1.5 hours. After 1.5 hours, punch down dough and form into a large round, using more flour if needed to decrease the stickiness again. Cut the round into 4 equal pieces and roll them into balls. Place on a baking sheet, cover and let rise for 20-30 more minutes. Take the dough balls and roll them into tighter balls again, then brush each with beaten egg. Gently score the top of each loaf, then bake for 40-45 minutes, or until golden. Let cool completely, then using a serrated knife, cut a round out of the middle and fill with soup! Just wait until I tell you about it. Just wanted to stop by and thank you for this recipe. I found it on Pinterest a few weeks ago and made them for dinner tonight. They were perfect with the potato soup I made. We’ll definitely be making these a lot. Thanks again! My family better prepare for evvvverrything to be served in a bread bowl for the rest of the immediate future, because I’m kind of obsessed. These are pure perfection for wintertime soups! I love sourdough, too. How would I change the recipe to make it whole wheat sourdough? Thanks! Very yeasty. The taste is over powering. The held up for the soup though. Sturdy. Just couldn’t get past the taste. I followed recipe exactly.